Use your money effectively during Christmas and find ways to save up using our list of 14 Free Christmas Crafts Made from What's at Home. We have everything from Christmas home decor to easy Christmas kids crafts, all using what you already have on hand. You don't need to spend a lot of money on homemade Christmas ornaments or even your own wardrobe - all you'll need is the right Christmas craft tutorial to show you how to think outside of the box. You don't have to look far and wide for supplies, either - check out your recycle bin or junk drawer and discover a ton of great options. You won't believe how many amazing craft projects can be found in this one free eBook. Download a copy of 10 Quick and Easy Christmas Gifts to Make and find fun presents for everyone on your list. DIY Christmas gifts are a great way to show you care. Be sure to personalize your project so it really stands out. You'll cut costs significantly if you substitute store bought decorations with your own Christmas decor designs. Recycled Book Rosette Wreath - Bring your old books to life in an eco-friendly way. Plastic Bottle Christmas Tree - This tree craft will have your guests in awe at your crafting ability. Floral Tree Light Reflectors - Add extra shine to your tree using a very flexible material. There's nothing more special than your very own handmade Christmas ornaments hanging on your tree each year. Folded Christmas Cards Ornament - An eye-popping ornament also shows off your favorite Christmas cards. Felt Pinecone Ornament - This free Christmas craft is a great way to use up extra fabric. Once you're bit by the recycled Christmas crafts bug, you might not be able to stop creating amazing projects. Next to you have a party, save your wine bottles to create genius craft projects. Did you know you can make a wreath, vase or even Christmas ornaments using wine bottles. Check out 14 Wine Bottle Crafts For Christmas and find out how to do it. These free Christmas crafts are as fun as they are thrifty. "We Love You" Jar - Help your children show thanks to a loved one with personalized messages. Christmas Candy Train - Any scrapbook lover will want to add this colorful page to their latest book. Gingerbread Men Garland - Nothing's simpler than this, and it lets your kids add their own projects to your Christmas decorations. Christmas Play Dough for Kids - They'll love making and playing with this durable craft. You'll save money by making free Christmas crafts with convenient, reusable materials. 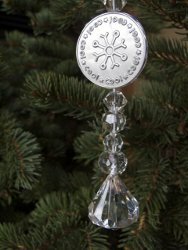 CD Christmas Ornament - Even if they're scratched up, your CDs can become a special part of your Christmas decor. Embossed Soda Can Snowsicles - Elegance doesn't come from a price tag, and this craft is the best proof. Christmas Card Letters - Grab some Mod Podge and use your favorite cards as a source of DIY inspiration. 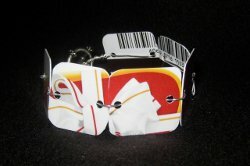 Refashioned Gift Card Bracelet - Find out how useful gift cards can be even after you're used them up. Hand Painted Christmas Tree Apron - The kids will love helping you design this for yourself or someone special. Of all the designs on this page, I think the holiday ornaments made from Christmas cards has to be my favorite. Do you have one that you absolutely love? I like repurposing things you already have around the house or get as gifts because you put less in the landfills at the end of the day. This is a great way to get started on more budget friendly Christmas crafting.